Your hardwood floors are not only beautiful; they are a great investment and deserve proper care. Some traditional cleaning methods can be damaging to wood. By using a plain mop and bucket, you can saturate floors with excess water, which can cause the wood to swell or buckle. Additionally, inappropriate cleaners may leave a dull residue. So how do you care for your floors? That’s where Orange Glo comes in. We are committed to helping you keep your hardwood floors beautiful and protected. The Orange Glo Hardwood Floor Care System is an easy-to-use maintenance program for all wood floors. That hardwood luster you love can last for years with the help of Orange Glo! The Orange Glo Hardwood Floor Care System is packed with the products necessary to help keep your floors beautiful for life. Orange Glo Mop Head (with 3-piece pole): This specially designed mop has a low profile and easy-to-maneuver swivel head. It’s the perfect cleaning tool for hard-to-reach areas such as under furniture and cabinets, around doors or in tight corners. 32 oz. Orange Glo Hardwood Floor Cleaner: Our water-based, non-toxic cleaner is specially designed for polyurethane finished hardwood floors. Unlike all-purpose cleaners and oil soaps, it quickly cleans tough stains and spills without dulling your floor’s finish or leaving any residue. Plus, there’s no mixing or diluting; Orange Glo Hardwood Floor Cleaner is full-strength and ready to use. Two 24 oz. bottles of Orange Glo Wood Floor Cleaner and Polish: Protect, polish and clean your hardwood floors in one easy step. It gently cleans away dirt and grime, while leaving nothing behind except a beautiful shine. Two Allura Fiber Cleaning Pads: The electrostatic action of our cleaning pads actually attracts and traps dirt and allergens when used dry. 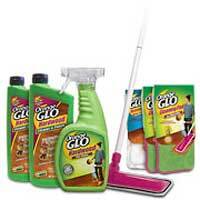 Used with the Orange Glo Hardwood Floor Cleaner, they absorb spills and remove tough stains. Plus, they’re reusable and washable, making them more economical than disposable systems. Allura fiber Dusting Pad: For use with Orange Glo Mop. Electrostatic action attracts and traps dirt and allergens.